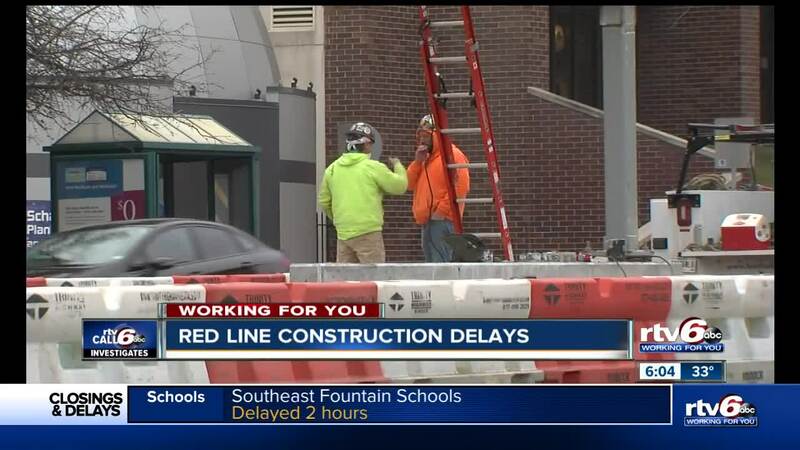 As IndyGo accelerates construction on the Red Line at a cost of nearly $3.5-million dollars after learning it was months behind schedule, Call 6 Investigates has obtained new emails that are shedding light on other concerns with the project. INDIANAPOLIS — As IndyGo accelerates construction on the Red Line at a cost of nearly $3.5-million dollars after learning it was months behind schedule, Call 6 Investigates has obtained new emails that shed light on other concerns with the project. Last week, Call 6 uncovered that the construction was 114 days behind schedule and to get it back on track so it could be completed by the end of the Summer this year, they are paying the lead construction company millions out of the projects contingency fund to get it back on track. After our story aired, we received a number of tips and copies of internal communications at IndyGo about the Red Line project. One of those is raising questions about having enough drivers to staff the Red Line and the other increased bus services around the county, as part of the Marion County Transit Plan approved by voters during the 2016 election. "I'm very concerned about the staffing required to launch new service in 2019," the email sent among IndyGo's executive team in December said. "We are behind our targets and have been for some time." The email discusses a number of issues, including losing staff members and qualified drivers. "The current recruitment is not even keeping up with attrition much less growing our number of operators," the email states. "We are behind any realistic schedule and we need a well thought out, coordinated and funded plan to reach our service requirements." The email also discusses the need for recruitment and concerns about training operators on the new bus rapid transit service. "I have yet to see a detailed plan for recruitment, on-boarding, training and deployment of new professional coach operators, as well as the training plan for ALL professional coach operators on the new BRT service," the email said. The email goes onto say, "We have been talking, talking and talking, but now I want action and need to see THE PLAN and how we will reach the targets." We asked IndyGo about the specifics in this internal email. In an emailed response Sunday evening, they say, "We continue to recruit for operators. Training is paid at $16/hr for new recruits who already have a CDL (Commercial Driver’s License). Full time wage after training is nearly $20/hr." "We will begin training all our operators for BRT buses in March," the emailed statement said. "In addition, we have additional openings for mechanics and administrative positions to implement our $500M capital investment that is the Marion County Transit Plan."